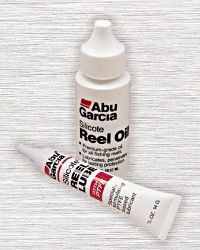 A combination pack of Abu Garcia Reel Oil and Abu Garcia Reel Grease (Lube) for lubricating and protecting all types of fishing reels. These reel oils have been proven during more than 20 years usage at the Ambassadeur Reel factory. Exactly as described, and I couldnâ€™t find the product elsewhere. Goods were as specified and anticipated. The kit was a lot smaller than expected, obviously for only one reel and the grease tube held very little grease considering the cost of the kit. Well priced and exactly what I wanted. Does the job it's meant for. Item as described, quick delivery and communication. Superb product, overhaulled all my reels & they have all been improved.